Ciao Lilli, come stai bene in stile sporty chic! Bella la tua pelliccia ne avevo una simile ma l'ho data via pensa che scema che sono! Un perfetto outfit casual. Buon inizio di settimana Lilli. che carino il pellicciotto! :) sembra molto soffice, mi piacciono molto anche i jeggings di calzedonia! Che bella la fantasia B&W del pellicciotto abbinata al rosso... devo provare anch'io, ho una giacca molto simile alla tua!!! Fantastico questo sporty-chic look!!! Quel maglioncino rosso che si intravede è perfetto per ravvivare il look. Hi Lilli, I'm sure that leopard coat meets function very well wrap up, I like the red accents, rings and bag are great too, you have good week. Hello Lilli!!Wow! !You look gorgeous! !Lovely style!! Like your jacket and all the red color in combination!! Have a happy week dear! Nooo voglio la tua pelliccetta, è un amore! Bellissimo il tocco di rosso del maglione, perfetto! I really like this style, sp comfy, sporty and casual. I love this jacket on you, Lilli! And the sunnies too! You make sporty looks chic, how you managed to do that is beyond me. I look like a bum whenever I am in a workout gear. LOL! I tried looking for the NYC lipstick but couldn't find it here, maybe I'll try another store this weekend. You look so pretty!!! lovely jacket!!! Nice comfy look! I like the size of the bag; ideal for most situations. Have a lovely week. molto carino questo look e i dettagli rossi mi piacciono davvero molto! Sei bellissima! This sporty chic look is so pretty on you Lilli! Red is definitely your color as it looks so great with your skin and that leopard fur bomber pairs so beautifully with your turtleneck as well as the rest of the look. You should be the poster girl for sporty chic since you always wear it so well. Have a lovely week dear friend! Stai benissimo Lilli, adoro questo look! Baci. You look adorable Lilli and the skinny jeans and jacket with the pop of red looks perfect. Also, I LOVE Converse All Star - I used to have so many and I need to get a classic white pair again when I'm back in SF and do some shopping. 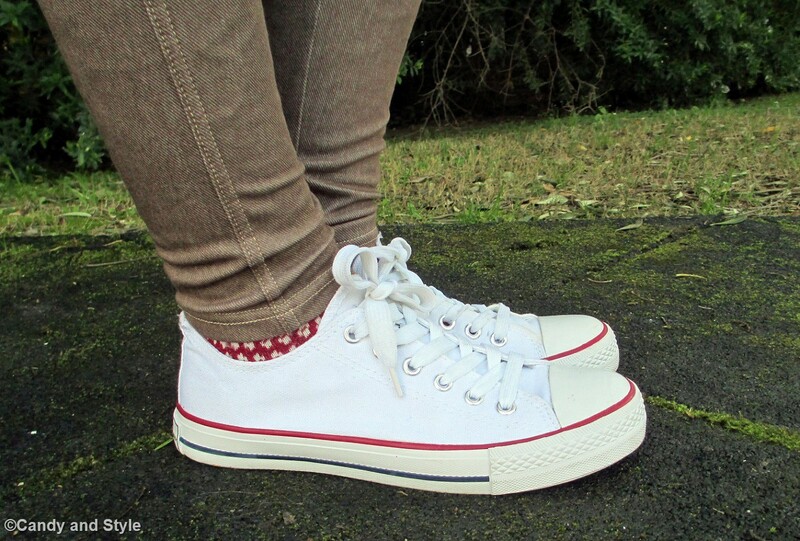 White sneakers are everywhere right now and they're so cute for Spring! Troppo bello questo pellicciotto Lilli, poi mi piace in versione sportiva, con le sneakers! Proprio bella questa eco pelliccia lillina..
Bellissima la pelliccia, quanto mi piace in questa versione sporty, ma chic e femminile! So lovely Lilli. You mixed your faux fur jacket jacket well with the sporty casual look. I like your lipstick colour. It's not so red. Looks like it has a hint of coral. Enjoy the week! You look absolutely smashing Lilli. This sporty look is so cool and fun! Red suits you so well, it is definitely your color! Molto bello questo pellicciotto, adoro i look così comodi! Che bello questo look sporty-chic, mi piace molto l'accostamento del pellicciotto B&W con il maglione rosso! ti sta molto bene il rosso! I like the same things as you Lilli. I do like faux fur and there seems to be a lot around for A/W 15. I don't own anything at the moment but I'm sure I will buy something. I definitely love leopard print and hyave a few items with this print and I'm adoring my sneakers at the moment. It's a great look - casual, comfortable but still chicwith the sunglasses and red lippy. You rock! Amo la stampa leopardo con i tocchi di rosso, sei bellissima Lilli <3 Un bacio grande ! That's like a snow leopard Lilli! Looks so cool on you! Love how you added red and a neutral for the bottom. Looks really good on you! That jacket though! And the red. Love this whole look on you, casual but super fierce. Happy Wednesday Lilli! You look amazing in red!!!! Beautiful photos and a chic look!!! !